A superb 84th minute volley from birthday boy Adam Evans gave Bohemians a well-deserved point on Bank Holiday Monday, and ensured Keith Long’s men kept pace with the chasing pack in the SSE Airtricity Premier Division. The Leesiders had taken a very early lead through Mark O’Sullivan, but were otherwise unimpressive as the home side dominated possession and territory for most of the game. With 21 points from the opening round of games, even the most optimistic of Bohemians fans could be forgiven for doing a double-take at the league table with everyone playing each other once. The Gypsies have shown a work-rate and togetherness that has simply overwhelmed many of the teams in the league so far this season, writes KEVIN FAGAN. Following his heroics in Derry last time out, Mark Griffin was given the nod up front for Bohs in place of the absent Dean Kelly. However, it was Cork’s lone frontman that blasted this game wide open after less than two minutes. Griffin lost the ball cheaply, and Cork broke at a pace that simply wasn’t seen again in the 90 minutes. Former Manchester United man Liam Miller fed Mark O’Sullivan near the edge of the box. O’Sullivan ghosted past Derek Prendergast, and hit an unstoppable right-footed drive into the top corner of the net. The Bank Holiday crowd had barely taken their seats. Cork have been criticised for sitting back away from home this season, and this was exactly how the game panned out. Unfortunately for Bohs, they could only fashion half-chances that failed to really trouble Mark McNulty in the Cork goal. Roberto Lopes and Keith Buckley both had weak efforts that flashed wide. At the other end, O’Sullivan was making a nuisance of himself in more ways than one. He caught three Bohs players with a flailing arm / elbow on three separate occasions. Prendergast, Derek Pender, and Anto Murphy all felt the brunt of O’Sullivan’s challenges, which seemed to be intentional to the Bohs fans, but not to referee Padraig Sutton. O’Sullivan finally landed a knockout blow on Anto Murphy just before half time. While half-heartedly attempting to hurdle Murphy’s sliding challenge, his knee connected with Murphy’s head. While the Bohs defender played on for a few more minutes, he was sensibly withdrawn at half time for Dave Mulcahy. A feature of Keith Long’s tenure has been his excellent use of substitutions, and this proved to be the case once more. Adam Evans came on to replace Keith Buckley, and very much changed the game. His unpredictable style and injection of pace put Cork on the back-foot, and he offered more of an offensive threat than the duracell-like hard work of Buckley. 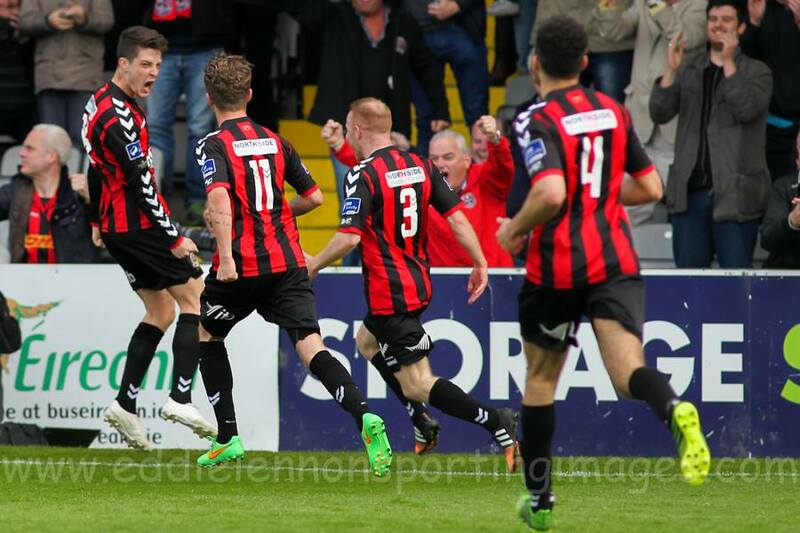 Bohs continued to knock on the door, and should really have drawn level with 10 to go. Pender slipped Marc Griffin through, and the forward’s shot was saved well by McNulty. However, the resulting bobbling ball could easily have been turned in by Jason Byrne, but somehow the Cork defence scrambled it away. The deserved equaliser arrived just 3 minutes later. Again, Pender was involved, with his cross only partially cleared by a Cork head. The ball fell to Adam Evans, who unleashed a clinical volley into the far top corner. It was the youngster’s 4th of the season, and a peach to boot. The full time whistle more than likely left both managers disappointed. John Caulfield would have been disappointed to throw away a late lead, while Keith Long’s men could easily have taken all three points. Onwards to a home game with Limerick on Friday for a rejuvenated Bohemians. Bohemians: Dean Delany, Derek Pender, Derek Prendergast, Anto Murphy (Dave Mulcahy, 46), Lorcan Fitzgerald, Kealan Dillon (Jason Byrne, 71), Robbie Creevy, Roberto Lopes, Keith Buckley (Adam Evans, 56), Paddy Kavanagh, Marc Griffin. Subs not used: Lee Steacy, Stephen Best, James O’Brien, Karl Moore. Cork City: Mark McNulty, John Kavanagh, Alan Bennett (Dan Murray, 41), Darren Dennehy, Ross Gaynor, Colin Healy, Liam Miller, Garry Buckley, Billy Dennehy (Kieran Djilali, 67), Mark O’Sullivan, Karl Sheppard (Danny Morrissey, 85). Subs not used: Alan Smith, Gavan Holahan, Kevin O’Connor, John O’Flynn.